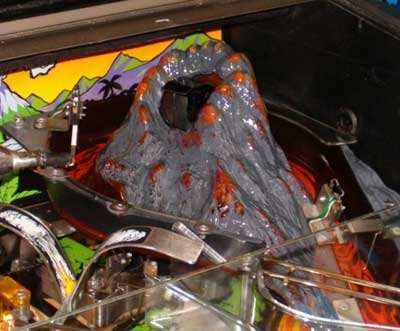 All Congo pinball machines have the same problem: at one point in time, the ball tunnel in the volcano suffers from severe blows against the roof, which breaks off. 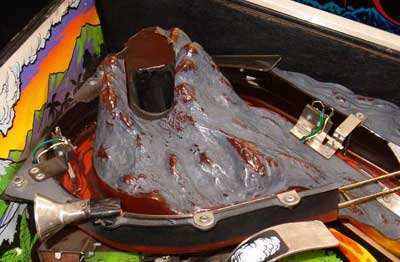 Then the volcano spits the balls against the top of the plastic volcano ramp, so this top breaks off as well. How do you fix a volcano ramp ? First, you get it out of the pinball machine. The missing top of the tunnel can be welded back on. 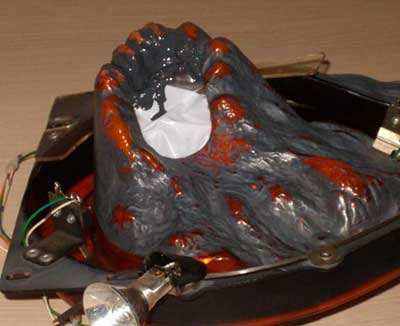 But then the volcano needs a beauty makeover. First, you stick some kitchen foil into the head of the ramp, so you have a basis to work on. You take a glass bowl and mix translucent silicone with some paint color that matches the lava of the ramp. Silicone is the best material in this case, as it remains flexible, in case the top should ever get bumped again. 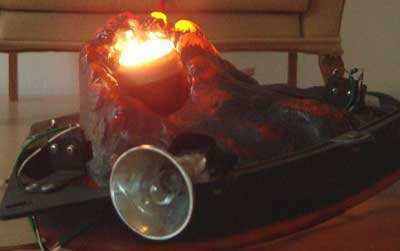 Also, it remains translucent, so the light still passes through when the volcano erupts and the lava lights up. You take a Q-tip and stuff the volcano top with the silicone. Then you take a paint brush and mold the top so it looks like the original (compare with a picture). 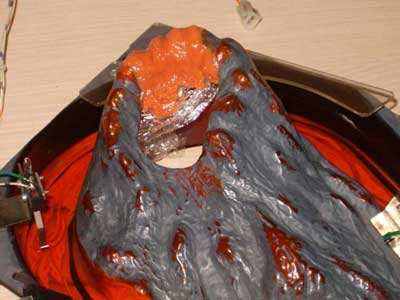 If the rim inside the mouth of the volcano is not round, don't worry, as you can cut that into shape once it's dried. Filled with orange colored silicone, you see the kitchen foil too. Once dried (it takes a day) you can pull the kitchen foil out. Now, you can cut the rim with sharp scissors. You can paint the grey of the volcano walls back on, leaving some parts of the lava visible (compare with pictures). Once that's dry, you can use uncolored (clear) silicone and rub it on the inside of the volcano, in a layer of at least 2 millimeter thick, so you have a protective layer against balls which could accidentally end up the mountain slopes. As silicone is very difficult to clean once it's dried, it will collect the typical pinball dust this way. To prevent dirt gathering in the silicone, you take a stronger type of plastic bag and pad it against the rubbed on layer. After a few hours, you can take the plastic away and the silicones structure is a lot smoother and easier to clean in the future. Strong plastic bag inside, outside painted and cut into shape. Once that's dried, you can reassemble the volcano ramp. The finished product looks as new.